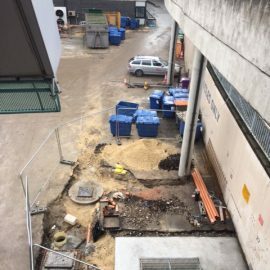 You may have seen or heard construction work taking place in the Goods Yard – this is located between Adsetts Library and the Owen Building. The work involves relaying the drains, resurfacing the area and improving safety for pedestrians. Where possible, Estates have planned for the majority of the noisy and disruptive work to take place at weekends, but inevitably there has been some activity during the week which can be heard in the Library. The good news is that the weekday work is now complete and there will be some respite until 17th March when the plan is to scrape back the existing tarmac surface and then resurface the area on 24th March. After this time, the heavy work near the Adsetts Library will be finished and while other activities will be taking place, the noise should not be above the expected level for the Goods Yard. The contractors will then focus on the goods road, further away from the library, and all work should be completed by the end of April. Due to the recent bad weather there may be some slight delays to the dates above, but we will update if we have any further news.